I love cheese cake. Give me a good cheese cake and I could probably eat the whole thing in one sitting...yes, my dirty little secret (smiles). Today I want to share with you a recipe my husband found...litteraly found. This piece of paper was floating around a parking lot of a store we were at a few weeks ago. He picked it up and found it was for Italian Cheese Cake. Put mixture into the crusts and bake at 350 for 30 minutes ~ or until done (I think we cooked ours for 45 minutes. When we made this it made two cheese cakes but my husband said it could have made 3. 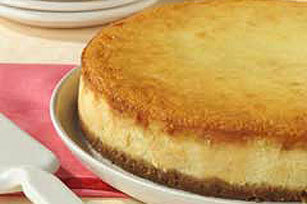 I hope you try this, I LOVE cheesecake and this was really really good. Please note: the picture is not mine I got it from google, my phone camera isn't working to take a picture of our cheesecake but this is what it looks like. Looks yummy! I LOVE cheesecake!! Sounds so good Mandy! I LOVE cheesecake! Ohh...Mandy, you should make some and bring it to church along with some strawberries! Yummmy!!! My husband LOVES cheesecake, this looks so great!